What happens when you combine blue, green, yellow and red water in a single glass? Brown, right? Not necessarily! By dissolving different amounts of sugar in each glass of water, you change the densities, allowing the colors to stack like a rainbow! 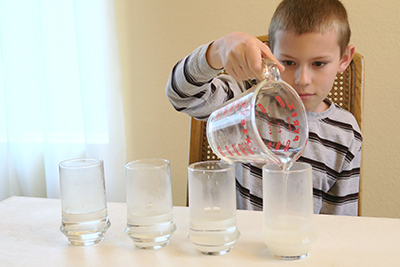 For this sugar water density experiment, you’ll need a few common household items, listed below. 1. Fill four glasses with 1/4 cup of warm water each. 2. Add 1 tbsp of sugar and 2 drops of red food color to the first glass, and stir vigorously to completely dissolve the sugar. 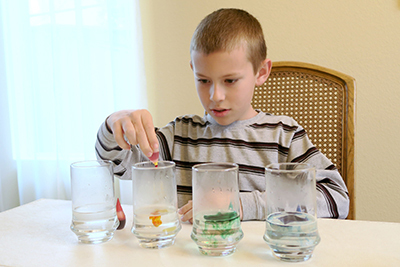 Add 2 tbsps of sugar and 2 drops of yellow food color to the second glass, and stir completely again to dissolve. Add 3 tbsps of sugar and 2 drops of green food color to the third glass (and stir). 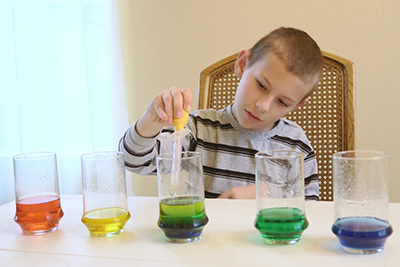 Add 4 tbsps of sugar and 2 drops of blue food color to the fourth glass. Note: Stirring to completely dissolve the sugar is very important; without the sugar fully incorporated into the water, you’ll have trouble getting the colors to separate. Don’t be afraid to heat up your water a little more, too, if it’s not working – 5 to 10 seconds in the microwave and an extra stirring session should help. 3. Use the syringe to transfer about half of the blue water into the empty glass. This is where you’ll make your rainbow. 4. Still using the syringe, transfer half the green water into the rainbow glass. Add it slowly on top of the blue water. It will sit on top. Add the yellow next. 5. Finally, add the red on top of the yellow. You’ll see a beautiful rainbow! NOTE: Make sure the sugar is completely dissolved before attempting to layer the colors – it’s what creates the difference in density of each color.